The member of the month for May is an amazing woman. Over the last few months, she has been quietly working behind the scenes, preparing a handout, updating mailing lists, and calculating orders. She went above and beyond organizing this year’s flower sales taking the time to clean up old files and find new ways to reduce expenses. Please join me in recognizing Sue W. as our May member of the month. We are lucky to have her in our organization. The member of the month for June is another amazing woman. Over the last year as a new member, she has quietly observed. Over the last few months she has really stepped it up, participating in the New Hope WT 5K and attending general meetings and events. 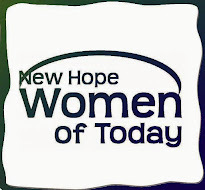 She has also been “in training” and has signed up to be this year’s new New Hope WT 5K chair. I’m excited to see all of the new ways she contributes to our organization this year. Please join me in congratulating Cassie L. as our June member of the month. We are lucky to have her in our organization. The member of the month for July is an amazing woman. If my records are correct, she joined in Women of Today 1987. Behind the scenes, she has been one of my mentors. Helping me, teaching me, and listening to me. She is not only my mentor, but also a mentor for many who have joined our group. She is quick to volunteer and chair projects. In the next few months, we will be hearing a lot from her as she prepares us for our Garage Sale and a few fun Living and Learning activities. Please join me in congratulating Rita J. as our July member of the month. We are lucky to have her in our organization. The Member of the month for August is an amazing woman. She is friendly and kind to everyone. This first trimester she has been working hard as the Women’s Wellness LPM sharing information and challenging the chapter. Last month she got us all up and out of our seats for some jumping jacks and ended the meeting with a fun photo of the chapter blowing kisses to a sock monkey. The big question is, what else does she have planned for us this year. Please join me in congratulating Bonnie H. as our July member of the month. We are lucky to have her in our organization. The Board member of the 1st Trimester is another amazing woman. This woman has stepped up as a calm and supportive voice for our chapter. She volunteers to chair projects, attends all of the board meetings, and makes the time to send chapter information to the state. She also started the year of with a bang, by reviewing, and redoing the look of our chapter budget. She cut expenses and helped clarify which donations go where. Please join me in congratulating Alicia P. as our Board Member of the 1st trimester. We are lucky to have her in our organization.